I recently got into eating salmon and since then, I have made it a point to order salmon at every single restaurant that I have been to. Since some people see this as a food blog, I decided to do a recap of places where the best salmon are. Hope this helps. 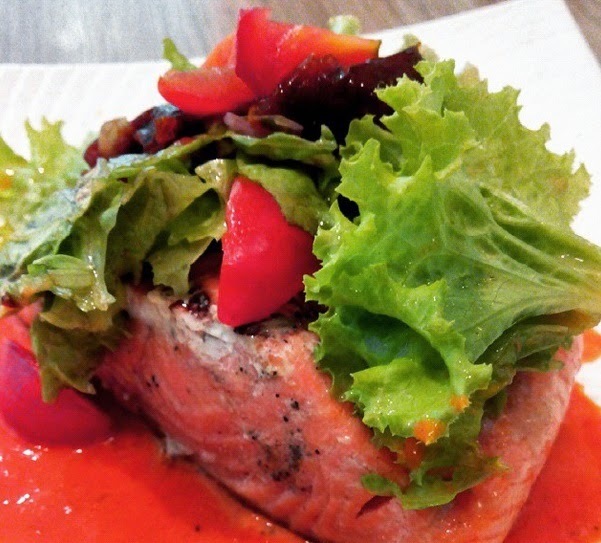 The Urban Farm offers salmon with vegetables on the side that are grilled so its healthy. However, the cream they put on top of the salmon was a little bit too much. It kind of ruined the salmon which was sad because the salmon was really, really good. Mona Lisa Ristorante offers salmon pizza and this was the healthiest thing they had on the menu. The crust is made of wheat and it comes with asparagus. It was super good. Krazy Garlik's salmon was quite big and filling. It came with buttered veggies and was cooked just right. I'd say that this is one of my favorite. I can definitely see myself coming back for more of this. My favorite though is the salmon from Museum Cafe. It was very fresh and fleshy. It could use less of the sauce but I think everything else was just right. The good thing about salmon is that its very healthy food and at the same time tasty. I'm glad that I finally learned to appreciate salmon. Next feature I make will be home cooked salmon. I'm hoping to discover more ways of cooking salmon and making it delicious so that this whole getting fit thing wouldn't be too hard. Hi, I also have salmon whenever it's available in the menu. That grilled salmon from Krazy Garlik is making me really hungry right now. A kindred soul! Try it!